Cats are some of the gutsiest and nerviest animals in the world. They can be bold and reckless, and often those traits emerge when they want something badly. Anyone whose cat has opened the fridge in the middle of the night to raid the meat drawer knows precisely what it's like to own a cat who will do anything to get his way. These clips focus on cats who know what they want and how they can get it. Without shame or regret, these felines are willing to go all out to achieve their desires! Check out how they succeed and fail in the videos below. 1. To this cat's credit, at least he was gentle. Many cats feel they should be fed on their predetermined schedule, and their owners should instinctively be aware of it. The cat in this video is hungry and decides to try to wake up his owner to let her know that he needs to be fed. He's much kinder about it than most cats! Does your cat act this way? Watch the clip and compare. 2. This cat will be all set when the aliens invade the planet. A giant stuffed alien cubby might not be the cozy spot of choice for most felines, but it works for this cat. He doesn't care that he looks utterly ridiculous in an incredibly cute way. All that matters is that he has his napping place. Check out how the alien "eats" the cat below. 3. There's nothing wrong with this cat's mode of defense, so stop laughing at him. Cats are excellent at making do with whatever is handiest. In this case, during a particularly lively wrestling match, one cat took up his spot of defense in a large plastic bag. Hey, if it works, good for him! Check out these cats' antics below and have a good laugh. 4. Not all superheroes wear capes. Some wear fur. Every cat is a hero, and in the case of Terry the cat, a superhero. 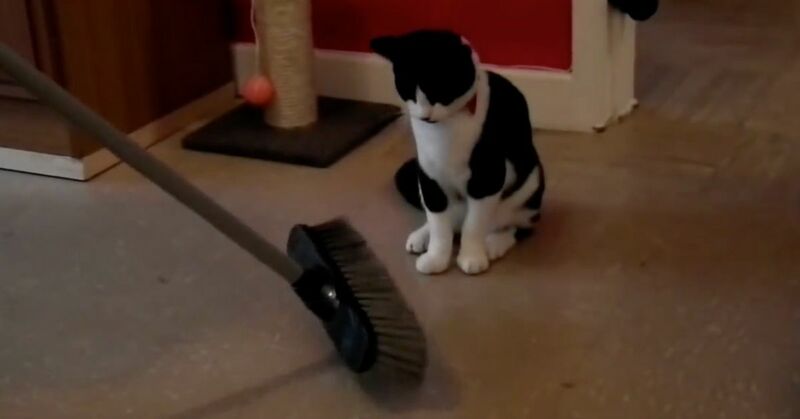 Terry regularly dedicates time in his week to battle the Mop Monster who threatens his home. You're a true inspiration to us, Terry. Keep fighting the good fight! Watch Terry at his superhero best in the following clip. 5. This cat is cleverly disguised as a human. Would your cat blatantly take bags of candy off the kitchen counter? Well, this "cat" sure does! Laugh along with this funny video.